You are out enjoying a leisurely stroll down the Burlington Walking Path, or bike ride with your family on the Tricorn trail. Suddenly, a passenger van drives onto the sidewalk, striking you and your child, or comes barreling down at you from the boardwalk area. Pedestrian and bicyclist accidents are shocking and tragic events that unfortunately happen every day. The National Highway Safety Traffic Administration (NHSTA) reported that more than 5,000 pedestrians were hit and killed in 2015 nationwide. These fatalities occurred every 1.6 hours, with pedestrian injuries occurring every 7.5 minutes. Pedestrian accident statistics prove how prevalent this problem is on our roadways. 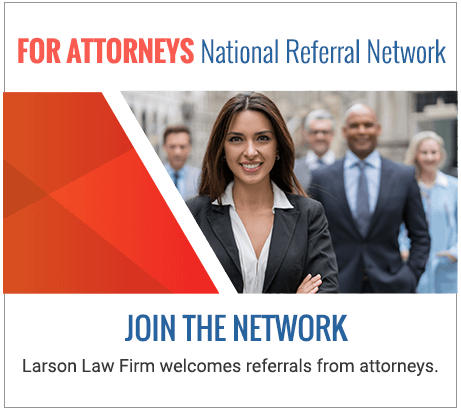 At Larson Law Firm P.C., our proven success record speaks for itself. With more than 35 years of experience, our tenacious North Dakota pedestrian injury lawyers fight aggressively on your behalf. We are committed to recovering full compensation for your medical bills, lost wages, and pain and suffering. The North Dakota Department of Transportation reported that, in 2016, a pedestrian accident occurred every three days, while a bicyclist accident occurred every four days. Though bicyclists and pedestrians have the same rights and responsibilities as every motorist, they are more vulnerable to injury without the protection of a vehicle. Injuries can weigh heavy on your mind, especially if you suffer permanent trauma as a result of the car accident and are unable to work. Further complicating matters, some injuries do not show up until days, weeks or even months later. Our team of attorneys fights aggressively on your behalf to get you reimbursed for costly medical treatments and rehabilitation. At Larson Law Firm P.C., we understand the devastating impact of pedestrian and bicyclist accidents. We diligently work to eliminate legal worries and stress, so our clients can concentrate on healing and full recovery. To discuss the details of your case, set up a free evaluation today. Call our Minot office at 701-484-HURT or complete our contact form. We also provide legal representation to the residents of Ward, Williams, McKenzie, Pierce and Mountrail Counties.